The Battlefield Thread - The Bear and Badger - a better class of conversation. The thread for all things [i]Battlefield[/i]. Heh, I was thirty seconds away from making this thread then thought no...I'll give Webbo a chance to see if he still wants to do it. Good man Mod, if only because I can do a straight copy and paste from t'other place... erm, 360 thread if Oli doesn't show? I lent my copy of this to a ghost. Played a little over the weekend with a couple of people and noticed they seem to have vastly improved the joining and staying with your team. I had some great games and outstanding moments. The servers mostly behaved themselves too but I was very careful when choosing which to join. I'll get the upcoming dlc if people here are getting it. The destruction from the promo vid looks quite nice. 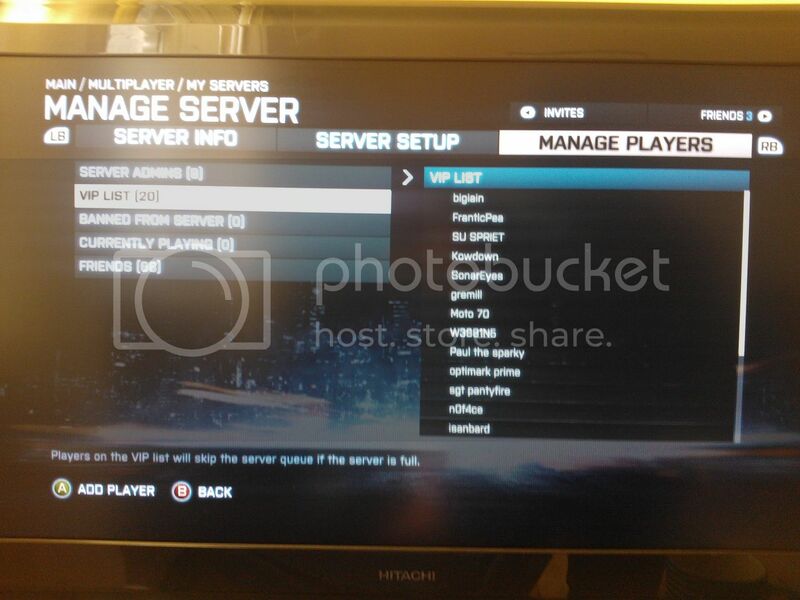 Despite everyone agreeing it's piss poor value for money and a huge con by EA I'm still up for renting a server simply so we can put together a sensible list of maps/gametypes/settings and not rely on the 500% ticket or "you were killed/booted by admin" crap shoot. Ideally IR should be in charge of it though as he's most likely to be on. How about I rent one on a short lease and then if the upsides do outweigh the costs those that are willing PayPal IR (or me if he doesn't want to do it) a couple of quid towards a longer rental. Split a few ways it's only really small change. I'm also buoyed by our new found esprit de corps, natch. I will help out with the server thing. At least to just give it a go. As for the CQB maps, with the latest patch and the general sorting out of things like the USAS/Frag the tight nature of them suddenly is a little more appealing. They might scratch a certain itch every now and then at least. I have zero enthusiasm for this now. Left it alone for a week, stuck it back in at the weekend, played two games, switched it back off. Current netcode is just going to fail the CQB maps, I'm thinking price drop that and pick up the larger map pack for sure. Really though, unless I see a TA contingent on, I'm less likely to boot up, Trials and last night, The Walking Dead is seeing BF off. Re: The server thing, I really would resent having to pay for the servers to get the experience we want out of this game consistently but i'm definately up for a short trial period to see if it would be worth it. Perhaps it's be best to wait until (hopefully) we get quite a few of us on regularly (perhaps when people have finished things like FEZ and the trials buzz has settled down a bit). I also think if we're to do it we should play for a few days before on normal servers so the experience is fresh in our minds so we can easily compare and see if it really would be worth it. The better game would be a blend of the two, favouring Bad Company 2 however, give me those maps anytime. I think Iain gave it a whirl several months ago but said it was a bit laggy, maybe just a one off. I'd still be loathe to ditch BF3, there is so much I like, it's just infuriating that DICE are so set on copying the COD template, and in doing so, have attracted some of that series' woeful players. Hopefully MoH and CoD will tempt away some of the bell-ends later in the year. ...and of course the netcode kills it at times. Talk to me about client side hit detection with dedicated servers, Cuckoo, what's the story there? End of an era. Since Trials and Fez came out I've not touched it. I might have a squint at the bigger map DLC, but if the netcode is shite it will still be a chore. I have Battlefield 3 on the PC, but my (now) outdated PC has some awful graphical problems, such as players disappearing if my settings are set too high etc. I was considering getting it for the 360, so is it worth it? From reading this thread it seems to be dying off a bit? We'll be back. It's still the go-to online shooter. Yeah, i'd say you should pick it up. I could have went for it on the PC (it looks so so much nicer) but I decided on xbox mainly because of the games I had with the guys here on BFBC2. I had a 3 month break from it where I didn't play at all but now i'm playing it again. What we really need is to set a day and try and get as many people on as possible, if we could have six or more of us on at once it's always (no lag permitting) a whole lot of fun. So, is lag an issue then? As I haven't experienced any lag whatsoever on the PC dedicated servers, even the 64 player ones. Mainly when a load of Americans join on to European servers, or if you're playing with people that live right beside the server. I'll not lie, it can be very very frustrating but I do think it has got a lot better recently. edit: the worst thing is actually when you're in a game that you can both have an advantage over some people and disadvantage over others. Normally you can recognise this and find another, better server. So, is lag an issue then? It's been a helluvah lot better than it was. Unlike PC players console ones don't seem to stop and check where in the world the server is before joining it so we'd get Brazilians and Japanese in the EU server. Shortcut to disaster. 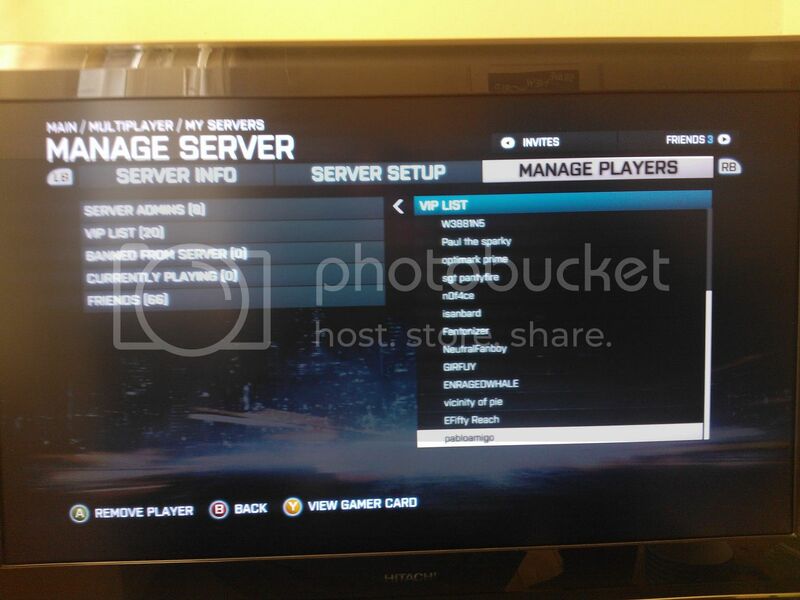 There was also rumours of all US players defaulting to EU servers. Now there's the rented servers there seems to be lots more around so people seem to manage to hit a region specific one more easily. Sometimes the server owner is on and will police kicking non EU (or even non UK) players as well. Personally the lag was never that much of an issue for me, but it's definitely better now. This is probably worthwhile, the playing solo while you wait for friends is the really unbearable bit now. I'm almost certain that it's way easier to join as a group/move teams now as well. I thought it was my imagination/wishful thinking at first but it's been excellent the last few times i've played. Aye, pick a week day and I'll probably show my face. It's better in small doses, so once a week with a full team should be fun. Right, we now haz a server. Happily you can have multiple server admins, so I've made the very regulars admins, and everyone else is on the VIP list. Currently they look like this. If I've missed anyone let me know. 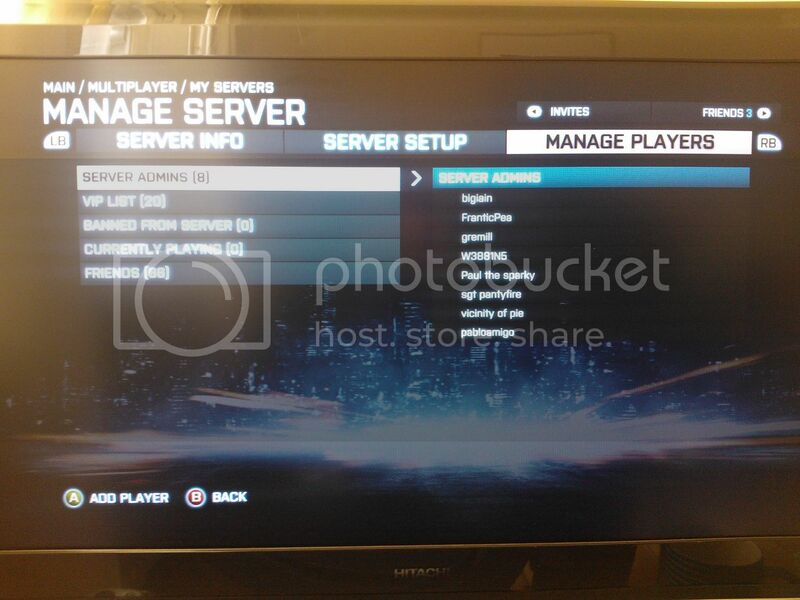 I'm not sure is admin status means you can change server settings, or just move/kick people in game. I guess we'll find out. VIP status means you're pushed to the front of any wait queue. I've put Admins on the VIP list as well, as I'm not sure if being an admin automatically makes you VIP, I guess not as the game let me add one person to both lists. I've only rented a week to see how it goes. I'll be on tonight to give it a crack. Yeah, i've just checked and it appears under 'My Servers' and appears to allow me to alter settings (I haven't). Hmm, i'm a bit excited by this, maybe it will be worth getting a server...Lets hope it goes well. Cool, I was hoping admin let you change the server settings as well, as long as nobody starts griefing and changing it to 500% Metro TDM we should be gravy. Great, I look forward to kicking any badger that I determine is lagging to fook... um, am I admin?